Early in the environmental industry soil and groundwater samples were acquired with mast driven drill rigs, which were more traditionally utilized for installing water monitoring wells. These large rigs could not maneuver in tight location and had height restrictions due to the mast. Geoprobe Direct Push Technology was an improvement over these rigs. DPT units were mounted on pickup trucks and could be driven anywhere a four wheel drive pickup truck could go. The pickup mounted Geoprobe DPT rigs as well as ATV (all terrain vehicle) mounted units allowed for drilling to be performed in hard to reach places and across lawns and hardscaping due to the lighter weight of the units. 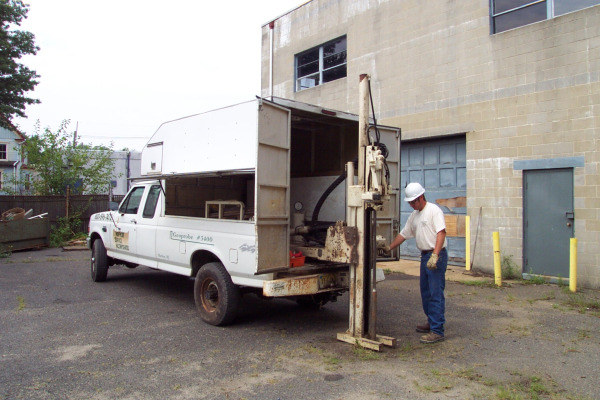 Curren operates both truck and ATV mounted Geoprobe drilling units for the collection of soil and groundwater samples. 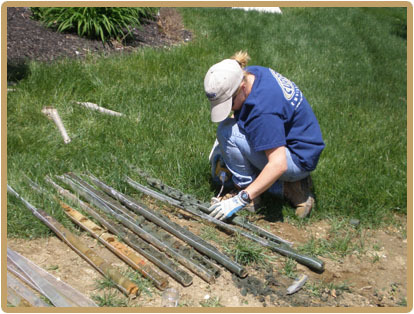 The most common method of obtaining subsurface soil samples is utilizing the Macro-Core Soil Sampler. THis sampler consists typically of a 4' long coring barrel that is advanced into the ground using a Geoprobe DPT hammer. The coring barrel or Macro Core has a clear liner inside. The liner captures the soils and allows a visual analysis across the length of the boring. The liner can be cut for soil screening and sampling. This sampling device works best in medium-to fine-grained cohesive, silt, clay and unconsolidated sediments. The Macro-Core® Sampler can also be used successfully in sampling medium-to coarse-grained sandy materials with some fine to medium gravels when core catchers are utilized. For situations where sampling beneath the groundwater table is required, then the Closed Point System can also be utilized. The LB Sampler is a solid barrel, piston sealed, direct push device for collecting discrete interval samples of unconsolidated materials at depth. This is a device that utilizes the Closed-Piston Method of sample extraction from the sub-surface. There are two different interval lengths for the LB Sampler. Curren has both the 2' and the 4' LB Sampler available to any project. While the use of a sealed sampler (i.e. LB Sampler) has proven to yield representative samples, a considerable time investment is required when coring depths exceeding 20 feet. The Dual Tube Soil Sampling System offers an efficient method of collecting continuous soil cores with the added benefit of a cased hole. This 1.5-inch diameter, piston-operated sampler features a positive release system that eliminates the uncertainty of continuous sampling. When the stop-pin is released, the user retracts the extension rod string which carries the released stop-pin and the piston-rod right into the operator's hand. Other benefits of this system are numerous. With a lightweight piston tip assembly, sample compression is minimized during retrieval. An O-ring on the tip ensures that the sampler remains sealed until the desired sampling depth is reached. Other features include increased durability, user friendly, easy to decon, and easy to maintain. While sampling loose, difficult-to-sample soils, use the MC stop-pin coupler. The piston rod and stop-pin are removed in this process which enhances sample recovery. The stop-pin coupler usually is not necessary when sampling in stronger, more consolidated formations, where sample recovery is not a problem.